The Employee Promotion Authorization Form is used to fill out the details of a job promotion authorization request. Use this form to state the reasons for the promotion and changes in benefits. ensures I do not miss anything that will get the contract rejected for missing an item allowing me to focus on proposal." This Employee Promotion Authorization Form is included in editable Word format that can be customized in Word or by using the included Wizard software. Employee: First Last Current Job title of signator, authorized signature or signer. Contract Job Title Current Department: Department Current Supervisor: Supervisor New Title: Insert the New Job Title New Department: New Department, New Supervisor: the New Supervisor Name, Effective Date(s) Effective Start Date: Start Date Current Salary: the Employee's Current Salary, Proposed Salary: the Employee's New Salary. Instructions: Supervisor must complete the following form and file it with the Human Resources Department. All Employee Promotion Authorization Requests must have an attached job description. Please state the reason(s) for selecting this employee for promotion. Changes to Benefits * Verified by Human Resources. Please note any increase or decrease of benefits as a result of this promotion. Supervisor is required to sign this Employee Promotion Authorization Request in order to gain Company approval and verify the descriptions of salary, schedules, benefits, job title, and duties. Upon approval by the Company, both Employee and Supervisor will receive written notification of said approval from the Company Human Resources Department. 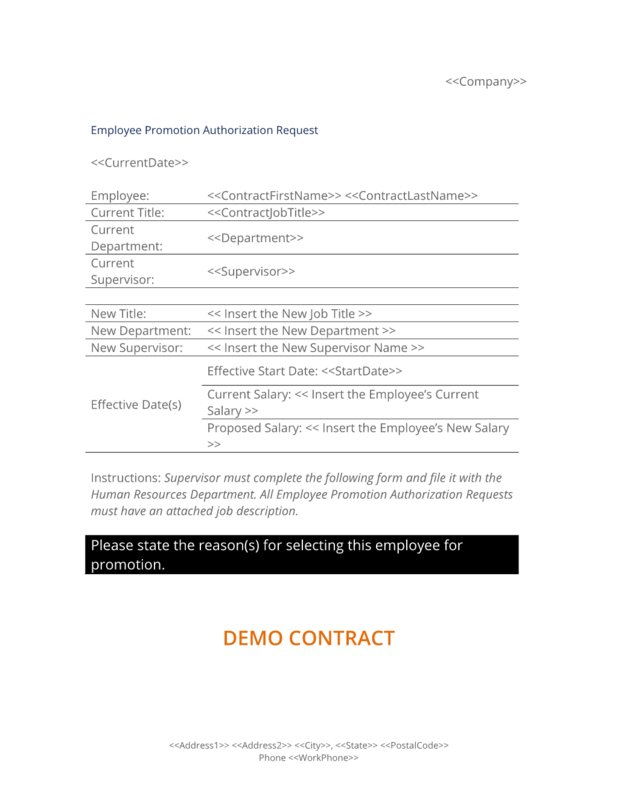 The complete Employee Promotion Authorization Form - with the actual formatting and layout - is available in this Contract Pack.